The New Park Street Pulpit and The Metropolitan Tabernacle Pulpit—the collected sermons of Spurgeon during his ministry with that congregation fill 63 volumes. The sermons’ 20–25 million words are equivalent to the 27 volumes of the ninth edition of the Encyclopedia Britannica. The series stands as the largest set of books by a single author in the history of Christianity. Spurgeon drew to his services Prime Minister W. E. Gladstone, members of the royal family, Members of Parliament as well as author John Ruskin, Florence Nightingale, and General James Garfield, later president of the United States. When Spurgeon arrived at The New Park Street Church in 1854, the congregation had 232 members. By the end of his pastorale, 38 years later, that number had increased to 5,311. (Altogether, 14,460 people were added to the church during Spurgeon’s tenure.) The church was the largest independent congregation in the world. Spurgeon typically read 6 books per week and could remember what he had read—and where-even years later. Spurgeon began a pastors’ college that trained nearly 900 students during his lifetime—and it continues today. 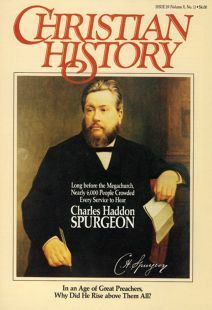 At least 3 of Spurgeon’s works (including the multi-volume Metropolitan Tabernacle Pulpit series) have sold more than 1,000,000 copies. One of these, All of Grace, was the first book ever published by Moody Press (formerly the Bible Institute Colportage Association) and is still its all-time bestseller. By accepting some of his many invitations to speak, Spurgeon often preached 10 times in a week. Spurgeon met often with Hudson Taylor, the well-known missionary to China, and with George Müller, the orphanage founder. Spurgeon had two children—twin sons—and both became preachers. Thomas succeeded his father as pastor of the Tabernacle, and Charles, Jr., took charge of the orphanage his father had founded.